Friday, 14th to Friday, 21st June 2019. Opening Times: 10.00 a.m. to 5.00 p.m. Limerick School of Art and Design, Clare Street Limerick. Quilting techniques Demonstrations daily from 1.00 p.m. to 2.00 p.m. Further details on their Facebook Page. 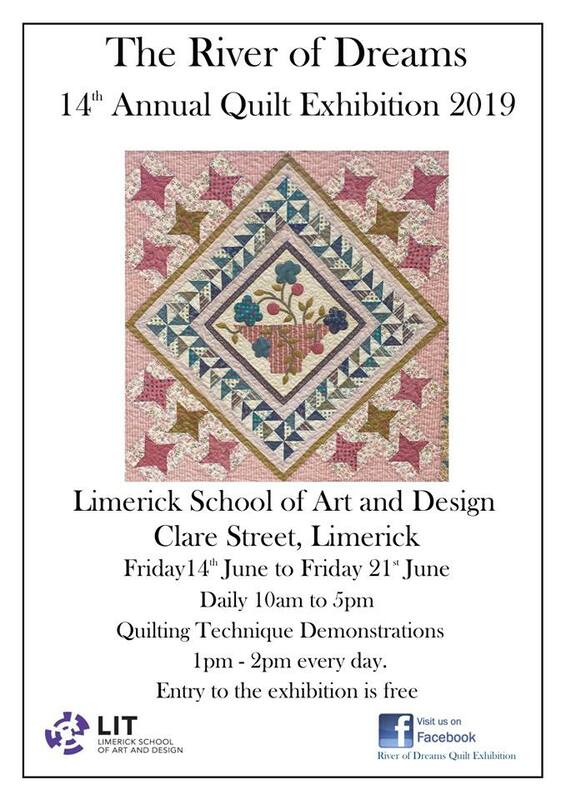 The Quilter’s Guild of Ireland are having an exhibition of its members work in St. Patrick’s University Hospital, James’ Street, Dublin 8 from 6th May to 28th June 2019. The title of the exhibition is “Our World of Colour”. Joint Exhibition by the Northern Ireland Patchwork Guild and Irish Patchwork Society. Northern venue: Flowerfield Arts Centre, Portstewart, 85 Coleraine Road, Portstewart BT55 7HU, NI. Southern venue: To be confirmed. An exhibition of quilts by Loose Thread Quilters in Larne Museum & Arts Centre, Victoria Road, Larne, BT40 1RN. The Exhibition will be open to the public from Friday, 5th April to Saturday, 27th April 2019. Opening Hours: Monday-Friday 10.00 a.m. to 4.30 p.m.and Sat 27th April. Admission Free. 1st – 13th February at Phoenix Park Visitor Centre. The official opening of the Exhibition is on Sunday, 3rd February 2019 in the Phoenix Park Visitor Centre from 2.30 to 4.30 pm. Tuesday 15th January 2019 7.30 p.m. – 10.00 p.m.
Wednesday, 16th January 2019 7.30 p.m. – 10.00 p.m.
“Earth, Wind and Fire” Exhibition – 23rd November – 17th February 2019. Mary Palmer is exhibiting in the Crawford Gallery in Cork. Entitled ‘Earth Wind and Fire’ which opened on the 23rd November and closes on 17th February 2019. More information here: https://www.crawfordartgallery.ie/Earth-Wind-Fire-2018.html. Kaffe Fassett and Brandon Mably are coming to Ireland in March 2019! Kaffe Fassett and Brandon Mably will visit the Northern Ireland Patchwork Guild in March 2019. 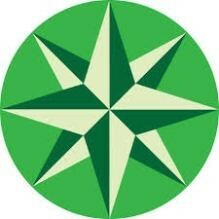 This is to celebrate 40 years of the Guild. 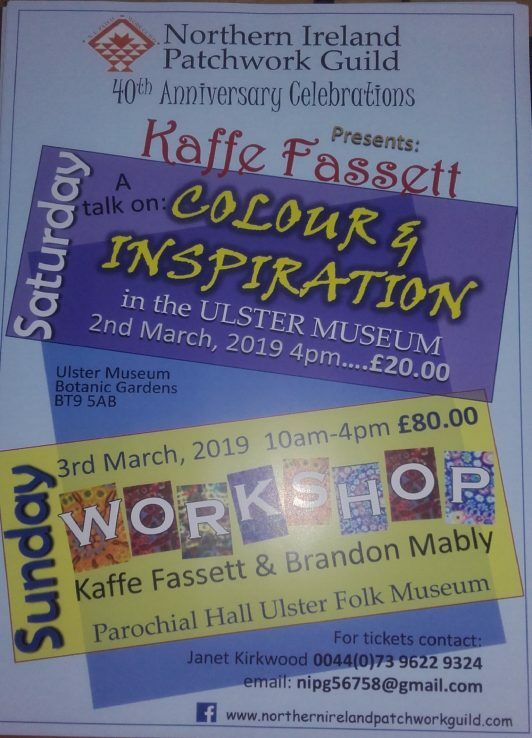 On the Saturday 2nd March at 4.00 p.m. there will be a talk by Kaffe Fassett in the Ulster Museum, Stranmillis, Belfast entitled “Colour and Inspiration”. Cost per ticket is £20 or €25. The museum holds 175 people so there are plenty of tickets still available. Kaffe Fassett and Brandon Mably are also coming to Appletree Crafts in Newtownmountkenndy (Park Hotel) for two days of workshops on 5th and 6th March 2019. Click here for full details. “Get Away” Bag Workshop with Maria and Terri. 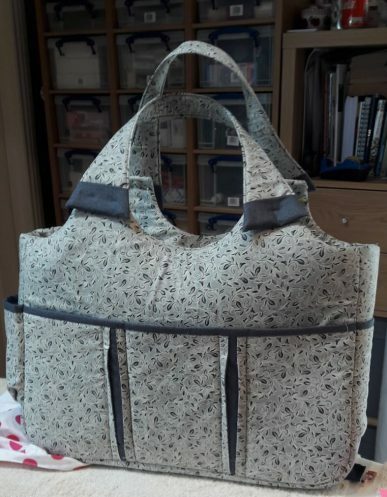 Large capacity bag – ideal for all your quilting needs, or indeed for a weekend away. Perfect too for all that Birmingham shopping! Contact Terri on 086 602 7516 or Maria on 083 008 3362 to book a place – limited places available. Requirements will be emailed once registered. Some fabric kits available – cost €52. WPG will be holding an exhibition of its work in the Signal Arts Centre, 1 Albert Avenue, Bray, Co. Wicklow, from 9th to 22nd July 2018. For an Entry Form (for WPG members only) please click here. 9th to 12th November 2017 at Simmonscourt, RDS, Dublin 4. NEC, Birmingham, UK between 10th until 13th August 2017. The IPS and The Northern Ireland Patchwork Guild present: “Hands Across the Border 2017” “Aurora”. Southern venue – the official opening of the exhibition will take place in Dublin on Tuesday 16th May 2017 in CHQ Custom House Quarter, IFSC, Custom House Quay, Dublin Northside, Dublin. Exhibition will run until Friday 26th May 2017. Northern venue is Island Arts Centre, Lisburn, June 2017. Thurles Source Library centre from Tuesday, 2nd May 2017 to Tuesday 30th May 2017. Library hours. (9.30 to5 pm week days and 10am to 5pm Sat. Closes 1pm to 2pm for Lunch. May/June 2017. Will take place at “The Mitchell Hall”, Spike Island, Cork. The Octagon Quilters will hold their 2017 Annual Exhibition of their work at Westport Town Hall, Co. Mayo daily from 12.00pm to 6.00pm during Monday 5th June 2017 until Saturday 10th June 2017. Admission Free. Hosted by Wicklow Patchwork Group and Appletree Crafts. Located in Appletree Crafts Quilt Shop from 6-11th of June 2017 and St.Matthew’s Church from 9-11th of June 2017, will be displaying quilts of all styles made by members of WPG, customers and students of Apple Tree Crafts and members of the public. Limerick School of Art and Design, Clare St, Limerick. From Friday 23rd June to Friday 30th June 10:00 am and 5:00 pm.